This is my partner Linda's first Gingerbread creation ever. She entered it into the National Gingerbread competition in 2008 and placed in the top 27. Not bad for her first try! It is patterned after the Riverboat at Disney World. She's already working on her entry for this year and it's only August! 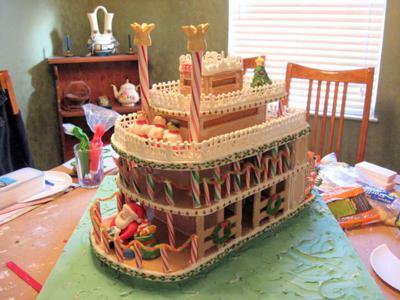 This is the only and I mean ONLY gingerbread sailing vessel I could find when I was looking for ideas for my contribution, The Flying Jolly Roger. Your Riverboat is just magnificant.